A solar trough power plant-the first built in the United States in 17 years-is part of a major expansion into renewable power being launched by utility company, Arizona Public Service Company. While the technology to produce solar power using photovoltaic (PV) cells is well established and well known from its many uses to power everything from cellular phones to commercial buildings, using parabolic-trough systems to harness the sun's heat to produce renewable energy is only now coming back in vogue in North America after an extended hiatus. 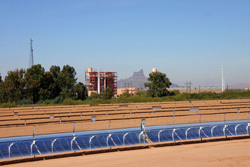 Arizona Public Service Company (APS), a major investor in PV solar power, recently completed construction of the first new solar trough power plant built in the United States in the past 17 years. The project was taken on largely so APS could reacquaint itself with the concentrated solar power (CSP) technology that was first put into commercial production in California in the mid-1980s. The $6 million, APS Saguaro Solar power plant is located about 30 miles north of Tucson, and according to project manager, Scott Canada, it is just part of a major expansion into renewable power being launched by the utility. APS is Arizona's largest and longest-serving electrical utility, serving more than one million customers in 11 of the state's 15 counties. It already generates 5.5 megawatts of electricity from PV solar power. The success of the Solar Electric Generation Systems solar thermal project in the California desert, which produces 354 megawatts of power-coupled with an imminent Arizona state-mandated renewable portfolio standard target-is what fuelled interest at APS to explore CSP technology further. The APS Solar Test and Research (STAR) Center is where APS works with other leaders in the solar industry, such as manufacturers, universities and U.S. national laboratories, to find and create technological advancements in converting solar energy into electricity. It is the only research center of its kind in the United States and one of only three in the world." We had taken PV solar power generation pretty far," says Canada. "We felt it was time to look at solar thermal because it really offers some operational opportunities." Demand for power in the Arizona/Nevada area has also been growing at four to five percent per year, which Canada described as "quite substantial." The knock against solar trough technology in the past, Canada says, has been the huge capital investment required for an economical facility. It was estimated that investors would need to build a 100-megawatt plant for it to be cost effective. APS wanted to determine if the combination of improvements in construction efficiency and incremental improvements in output and operational efficiencies achieved over the past two decades had improved the cost competitiveness of solar trough technology. The Saguaro facility is capable of producing one megawatt of power and features some of the latest power conversion technology from Nevada-based Ormat International as well as collector technology available from Solargenix Energy, headquartered in Raleigh, North Carolina. Solargenix Energy is a subsidiary of Acciona Energia based in Spain, and is collaborating with the National Renewable Energy Laboratory (NREL) under the USA Trough Initiative to reduce the cost, and improve the performance, reliability and U.S. competitiveness of parabolic-trough technology. Ormat International has earned a reputation for delivering quality equipment and installation services, and is also heavily involved as a supplier to developers of geothermal power plants. With CSP technology, parabolic-trough concentrators use extended curved and mirrored surfaces to concentrate the sun's heat on a thermally efficient receiver, which is essentially a pipe running the length of the trough. A heat transfer fluid, typically synthetic oil, is circulated through the receivers to achieve temperatures approaching 600 degrees Fahrenheit. 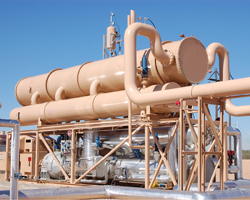 The APS facility is the first to combine solar trough technology with an organic Rankine cycle power block, which allows the plant to produce more power at lower temperatures, and is typically used in geothermal and biomass applications. The heated working fluid used in the organic Rankin cycle typically has a much lower boiling point than water, which helps to make the process more economical. The fluid steam expands through a conventional turbine/generator and produces electricity. The Ormat energy converter used in this installation is a complete engineered system comprising a turbine, a pre-heater, a vaporizer/superheater, a recuperator and a water-cooled condenser.To capture maximum sun exposure, concentrators track the sun throughout the day. 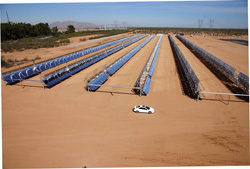 The APS Saguaro Solar facility features more than 100,000 square feet of parabolic-trough shaped mirrors and stands more than 15 feet tall. The mirrors are aligned in six rows, and provide enough electricity to meet the demand of 200 homes.Canada says the $6 million price tag for the Saguaro facility is not an accurate reflection of what a much larger solar trough facility would cost per megawatt generated, given the advances made in this technology. He says APS did not have the advantages of economy of scale and the Saguaro facility was the first project of its kind for many years. For investors to earn the best value for their buck, he says a 50-megawatt plant would be about the minimum, most economical size, with the optimum being around 250 megawatts. That is one reason why it is highly unlikely that APS would expand the Saguaro facility-but as a proving ground for this technology, it was very successful. For example, the Solargenix collector design at this facility uses an innovative new aluminum hubbing system developed in partnership with Gossamer Space Frames to create a structure that is 30 percent lighter, has 50 percent fewer pieces, and requires substantially fewer fasteners than earlier designs. The Saguaro solar power project is the first to combine solar trough technology with an organic Rankine cycle power block, typically used in geothermal and biomass applications. The block allows the plant to produce more power at lower temperatures. According to NREL, the aluminum structure provides better corrosion resistance and has been designed so that the mirrors are mounted directly to the structure and do not require any alignment in the field. The collector uses a new Schott-brand receiver featuring a number of improvements that increase receiver lifetime and performance. The end result is a collector that increases performance about 15 percent, decreases investment costs about 15 percent, and improves component reliability for a net improvement of about 35 percent in total cost effectiveness.One unique aspect to this technology, unlike PV solar technology, is its ability to produce power even at night. The plant has the potential to be combined with a large, insulated tank filled with a salt or rock material. This allows the hot working fluid to flow over this material, with its heat energy transferred to the rocks. The heat can then be brought on stream as needed as an energy source, particularly during the peak 5 p.m. to 6 p.m. demand period, when electricity prices are at their highest. According to Canada, a similar heat storage method has been proven in other installations. The Saguaro facility has been purposely constructed near an existing APS natural gas power generating facility, so that power output from the solar site can be supplemented with natural gas as an energy source, as needed, to maintain consistent power output. Canada says its ability to tie in with conventional fossil fuel energy sources like natural gas is another benefit to solar trough technology. California solar trough facilities are also tied into natural gas and produce between five and 10 percent of their power production from this energy source. The APS solar thermal site is also completely unmanned and is monitored remotely from the existing natural gas power generation facility a mile away. For the immediate future, the Arizona power utility's strategy is aimed at entering into power purchase agreements with private developers of renewable power projects, rather than pursuing construction on its own. That's because a 30 percent tax credit on plant construction is available to private developers, and not to utilities. At present, interest among developers in solar trough power plant construction is booming. "But I think the real question is where do they get hold of the construction know-how, because the developers are not necessarily those who put things into the ground," says Canada. It's important to scrutinize potential projects carefully to ensure that the developer has experienced contractors and equipment suppliers in place to deliver on a concept, even though the construction model is not particularly complicated. Canada likened the construction process more to homebuilding than installation of a high tech data center, because much repetitive assembly is required. For example, the hardware for the Arizona utility's one-megawatt facility consists of 250 structures that are 40 feet long and 12 feet wide. Assembly is one of those areas where investors have an opportunity to bring costs down in a solar trough facility. As with all solar technology, the amount of real estate required for a facility is an issue as five to six acres is required for the hardware to generate one megawatt of power. A 100-megawatt facility would require between 500 and 600 acres. This may or may not be a limiting factor, says Canada, as many existing power plants have acreage in reserve around their plants that could be used to install solar trough hardware. Acciona Energia, the parent company of Solargenix Energy, is one company hoping to capitalize on the collector and construction knowledge it has acquired, particularly from its involvement in projects like the APS Saguaro facility. It has just commissioned a 64-megawatt solar thermal power plant called Nevada Solar One on a 300-acre site near Boulder City, Nevada-the largest plant of this type in the world. Acciona Energia invested $262 million into the project and is the major shareholder. It is producing enough power for 11,000 homes.